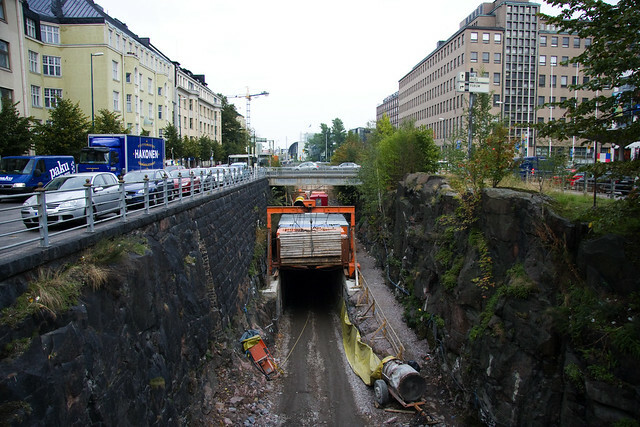 Last time I was in Helsinki I took this photo of this century old railway corridor that was used for freight trains. I can heard that it was being converted to a pedestrian and bicycle path and it turns out that it has opened recently. 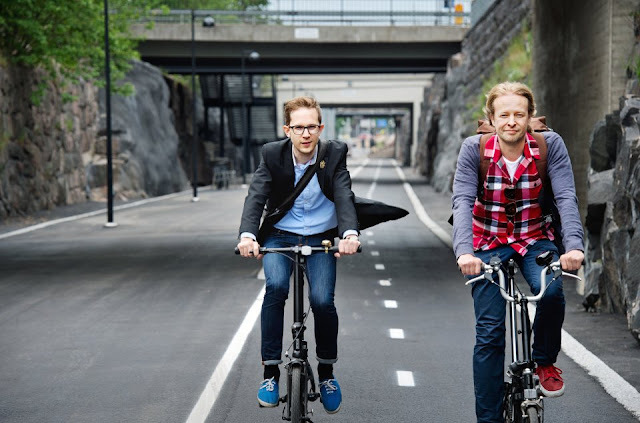 Helsinki's new "Low Line" (as opposed to NYC's High Line) opened on June 12, 2012, providing pedestrians and cyclists with a 1.3 km long connector between the Western Harbour area to Kamppi and Töölö Bay. It's called the Baana. It runs through the city centre, providing a safe bicycle route to many points in the city. There four ramps along the way to get back to surface level, as well as entry points at each end. On average, the Baana is 15 m wide, with 34 m the widest point. There are also facilities along the way like basketball, table tennis and petanque and lights and benches have also been placed there. So... a nice addition to the city. There was a gorge carving through the centre so why not put it to good use? Cheaper than filling it in I suppose. Not much light in this gorge in such a northern city for outdoor activities 8 months out of the year, but hey. The Finns will figure it out. It's an impressive project, costing between €4 and €5 million, although calling it a "superhighway" may be a slight exaggeration. It's no cycling tunnel like in San Sebastian, but it ain't all that bad. Let's hope, however, that it is a one-off. Cyclists in Helsinki in the 1930s had safe, separated, Copenhagen-style cycle tracks and there were daily cyclist counts of 10,000 on some of the main arteries, like we can see on these maps from 1937. The Baana is cool, but it's time for the city to get back on track with separated, roadside cycle tracks in order to meet the goal of the Charter of Brussels, signed by the city in 2009 at Velo-City in Brussels, of 15% modal share for bicycles by 2020. Will the Baana help reach that goal? Sure. A bit. But it's all about well-designed, Best Practice infrastructure now, if the city - any city - wishes to make a serious effort to return the bicycle to the urban landscape.